Difference between enabling Time Machine's "Encrypt Backups" option, and encrypting from Disk Utility? This Core Storage logical volume is already decrypting. Can someone explain to me what is going on? I'm concerned I'm doing something wrong. When it says that it is decrypting, is it decrypting the freshly encrypted drive so that my snapshots will be stored plaintext on the drive? That's clearly not what I want. But now Time Machine won't let me use the disk because the volume is not encrypted. So it looks like I did something wrong, which was my concern that led me to make the post in the first place. Oh well, it was just machine time. Is what I'm doing misguided? Did I miss a step somewhere or take a wrong turn? My question still remains: can someone tell me what is wrong with my process? I want to use the filesystem encyrypted format to backup my machine without Time Machine needing to encrypt the disk as a post process operation. Is this possible? In your case for 2 TB drive it can take up to few days. To keep it working overnight go to System Preferences > Energy Saver and leave the disk running. Of course leave it plugged in. Just to make sure it stays awake, you can use the caffeinate in Terminal. Not the answer you're looking for? 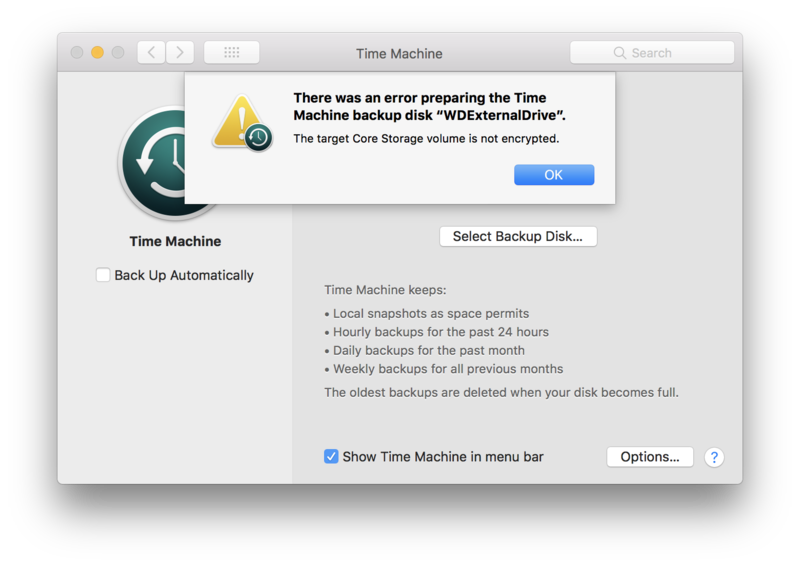 Browse other questions tagged backup time-machine disk-utility encryption core-storage .